In Concord, New Hampshire, a Democrat has occupied the corner office for more than a decade, but that could change in just two weeks. In one of the most watched gubernatorial races in the country, the scales have tipped in New Hampshire. 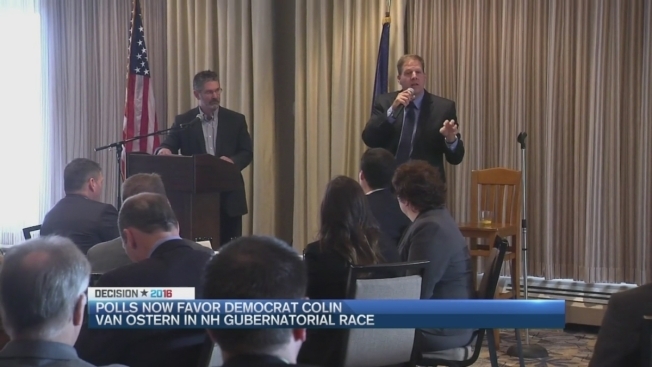 In the race for Governor, Sununu has been leading since the primaries, but according to the most recent University of New Hampshire poll, that changed last week. For the first time, it shows Democratic challenger Colin Van Ostern ahead by six points. Tuesday, Sununu denounced Trump’s words in the infamous Access Hollywood video, calling it “disgusting and reprehensible,” but he still supports and endorses his party’s presidential nominee. “My campaign isn’t about Donald Trump, my campaign is about the State of New Hampshire,” Sununu said. Political analyst Scott Spradling say the tipping scales in this race could be evidence that Trump’s campaign troubles are trickling down the ballot nationwide. “He’s in full-on defense mode and that’s one of the main reasons the polls are showing a widening gap and the bigger that gulf gets, the more other Republicans get swallowed in by that lack of momentum,” Spradling explained. When we asked Sununu about that recent UNH poll, he told us it was flawed and that it was Democratic leaning. His campaign says internal polls show Sununu winning. Spradling says the New Hampshire Gubernatorial race and the US Senate race in New Hampshire are critically dependent on voter turnout. He says they will be too close to call until the final hour.